Below is an analysis by the EDL writing team of the loss of liberty in Modern Multicultural Britain as exemplified by the arrest of Tommy Robinson and Kevin Carroll on their way to Woolwich last weekend. The hysteria that followed Tommy Robinson's announcement of his charity walk was due to his voicing opinions that the political 'elite' disagree with. His views amounted to questioning government policy, which is an essential characteristic of a free society. It is the right of any British citizen to point out the failure of Government policy, yet those with power want to silence him. It seems likely that pressure had even been put on charities not to accept any money raised by Tommy. One may also wonder whether similar pressure was put on the grieving family of Lee Rigby. If the so-called leaders of our society disagree with what Tommy says, then why don't they debate the issues with him in rational terms and without resorting to name calling? The reason is, of course, that they have no rational explanations, or at least none that would be seen to be in the interests of the country and its people. The events on Saturday clearly illustrate that British citizens no longer have freedom of movement within their own country. Very tenuous reasons are invoked to justify authoritarian restrictions on movement. Britain is clearly on the path towards the development of a checkpoint culture. The organisation euphemistically called Unite Against Fascism (UAF) has stalked the EDL since its creation and brought violence to the latter's otherwise peaceful events. According to the UAF website, current Prime Minister David Cameron was a signatory to the UAF's founding statement. His apparent reluctance to disavow UAF suggests that he is a key supporter of this violent group of botherboys. Is UAF actually run via orders from Downing Street itself? It will be interesting to find out whether those involved in the assault on Kevin prior to his and Tommy's arrest were agents of Cameron's street thug organisation. How can a sitting Prime Minister retain power while potentially commanding a street militia charged with attacking political opponents of the ruling regime? What sort of country has Britain now become? Indeed, was there collusion between these 'Cameron's Comrades' and the Metropolitan Police? In the Soviet Union, political commissars were placed in the military to oversee commanders and ensure their ideological purity. The events on Saturday suggest the existence of something similar in the Metropolitan Police. On Saturday, even with police all around the EDL leaders, a man was allowed to step forward and assault one of them. A police chief inspector, no less, was then immediately on hand to arrest the victims of the assault. Why did Tommy and Kevin have to be arrested by such a senior police officer? Was that officer a kind of commissar who was directed to make the arrest on political grounds? Surely a simple arrest, if fully justified, could have been carried out by an ordinary copper? Were the police who were around the EDL leaders allow the assault to take place because their mind was on politically motivated orders rather than their job? Is there a system of accelerated promotion for university — or Common Purpose — graduates who are willing to toe the political line at the expense of natural justice? If so, it is a clear threat to the liberty of the people of the United Kingdom. The recent revelations about the existence of smear squads in the Met that tried to demonise the family of Stephen Lawrence suggest the existence of a politically driven black-ops unit at the centre of its operations. It seemed quite readily on hand to do the Government's dirty work on Saturday and harass two people who happened to oppose some government policies that are deemed legally beyond the realm of criticism. Is a Metropolitan Police smear squad now targeting key EDL leaders in the same way it targeted the Lawrence family? Does the Met serve the public or the political elite and its ideology? There is a no more effective way of illustrating the incompetence of the political class than to point to the current economic malaise. This is obviously something to which the government does not want attention drawn. The Welfare State is used as a vehicle to control the masses. By pointing out the case of a girl who was sent home to die by the NHS the EDL was drawing attention to the welfare state's empty coffers caused by economic incompetence of the political class. This is something that clearly couldn't be tolerated! The message that a girl was dying because all the money had been spent propping up failed bankers would not go down well with the spin doctors. The implication of British Citizens being denied access to the London Borough of Tower Hamlets is that the Government has effectively ceded sovereignty of that area. It seems that Islamic 'community leaders' now have the power to grant or bar access to their territory that legally speaking is part of the United Kingdom. It is time for the Government to be honest and admit if it is no longer able to control areas that it supposedly governs. Saturday's arrest of Tommy Robinson and Kevin Carroll demonstrates quite clearly that sharia law is now routinely enforced in the United Kingdom. Naturally, it is not called sharia, but if it quacks like a duck…. If someone criticises Islam then they are in violation of sharia law. If the police arrest someone because they have engaged in such criticism then they are quite clearly enforcing sharia law. If the courts punish people for this then they are doing the same. Pretending that someone is arrested or punished for something else is just an exercise in smoke and mirrors. They are arrested / punished because they have transgressed the strictures and superstitions of sharia law! The Fourth Estate — the free press — has long been regarded as one of the guarantors of liberty. However, today it does not serve to keep the powerful on their toes, because it is the powerful who own it! Instead, it slavishly serves their interests and promotes their ideology. The EDL has been demonised by the legacy media since its foundation. The reporting on the arrest of Tommy and Kevin reflects this media bias. For instance, the video coverage presented after the event on the Sky News website studiously omitted the assault on Kevin. It focused on the arrest itself, presumably to put the EDL in the worst light possible. A free society cannot long endure if the media are corrupted in this way. Without an honest press liberty can be easily subverted. Common Purpose in the press, anyone? Tommy and Kevin were arrested on Saturday not because of what they did but because of who they are. Islamists by contrast are often not arrested and may get state funding in spite of what they do, because of who they are! This is not justice; this is subversion of the law, and strikes at the heart of the principle of equality before the law, and even the concept of the rule of law itself. This is clearly yet another lapse of liberty illustrated by Saturday's events. It is quite clear that in early 21st century Britain if you are Tommy Robinson you have no rights. For you, legal contortionists are able to turn even the most basic action into a crime. If you walk down the wrong street, not only are you assaulted, you are criminalised. 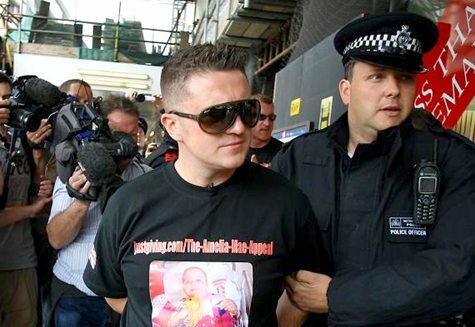 Walking while being Tommy Robinson is now regarded as one of the most heinous of crimes! Traditional rights and freedoms no longer exist for you. In the future anyone who 'becomes a Tommy Robinson' by questioning government policy will be treated in the same way — the precedent has been set and will be enforced again and again. Our free society is in serious trouble. Goodbye traditional English liberty!